With such a large range of reasonably priced health and beauty products made in Great Britain, there really is no excuse for not buying British when it comes to looking after your skin. Please also click the link in this sentence to see my favourite British made bars of soap. And for shaving related products, please see Shaving products. For British made hairbrushes and combs please click the hyperlink in this sentence. For magnetic copper bracelets click here. Enliven Health and Beauty products are made in England. http://www.enliven.co.uk Enliven is available online at www.brandrefill.co.uk and from shops and and wholesalers within the UK and Worldwide. Enliven Original Antibacterial Handwash. Made in England. 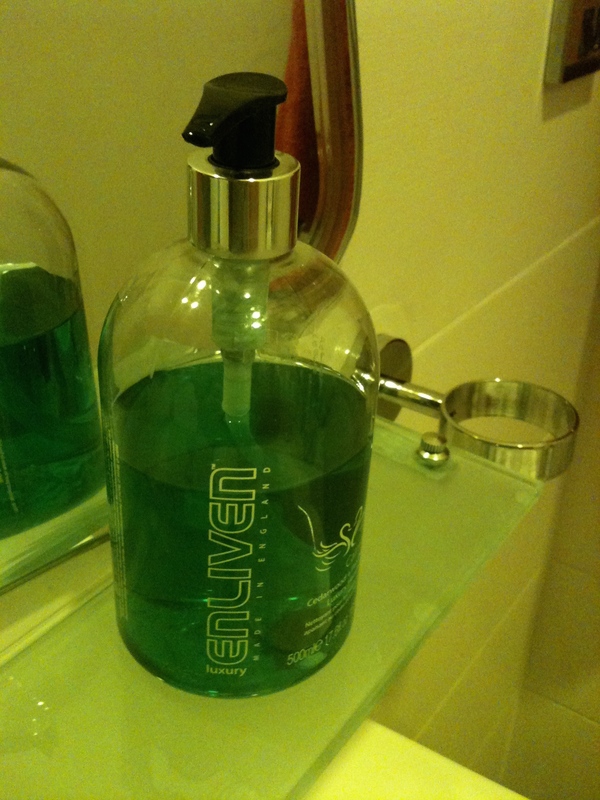 Enliven made in England liquid hand soap in use in a French restaurant in Islamabad, Pakistan. Photograph by author. Photograph by author 21 August 2015. This entry was posted in Body Shop, Cosmetics, Health and Beauty, Household products, Lush Cosmetics, Men's Grooming, Neal's Yard, Nelsons Healthcare Products, Rimmel London and tagged Aldi, APPLE & BEARS, Arm & Hammer, Arm and Hammer, Arnest International, Arran Aromatics, Asda, Avoca, Batiste dry shampoo, Bayliss & Harding, Bayliss and Harding, Beco, Bedforth Soap, Bee Good, BENZ and BLANC, Body Shop, Boots, Bulldog, Chain Bridge Honey Farm, Chulo Naturals, Cole and Lewis, Conscious Skincare, Crabtree and Evelyn, Cuticura, Cyclax, Cyclax Aloe Vera, D R Harris, Deb, Dr.PAWPAW, Eden, Enliven, Enliven Health and Beauty, Fairfield Gardens, Faith in Nature, Flint and Flint, H2k, Health and Beauty, Honest Skincare, Initial, Inner-Soul Organics, Jo Malone, John Drury, Kay's (Ramsbottom), Lala and Bea, Lush, Malibu Health Products, ManCave, Marili Skincare, Mibelle Group, Molton Brown, Monroe London, Monu, Morny, Morny Aloe Vera, Murdock, Natural Extracts, Neal's Yard, Organics at Home, PAIRFUM, Pecksniff’s, Potions & Possibilities, PZ Cussons, Queen Cosmetics, Richards and Appleby, Robinson Healthcare, Rockface, Sainsbury's, Scottish Fine Soaps Company, Seascape, Sheila’s Natural Creams, Simple, Sinivalia, soapNskin, Southsea Bathing Hut, Superfine, Tesco, The Natural Deodorant Co, The Sheffield Skin Company, The Soap Co, Trevor Sorbie, W.S. Robson, Waitrose, Waitrose Pure, Woods of Windsor, Yardley on August 12, 2013 by ukmade. Read the full article on the BBC. This entry was posted in Body Shop, Cosmetics, Health and Beauty, Men's Grooming, Shaving and Beard Care, Soap and tagged All Natural Soap Co, Arthouse Meath, Asda, Avoca, Bar Soap, Barsoap, Bedforth Soap, Bellingham Soap Company, Body Shop, Boots, Bowman&Williams, British made soap, British Soap, Chilly b Soap Company, Christina May Soaps, Co-op, Cole and Lewis, Crabtree and Evelyn, Creightons, Cuticura, D R Harris, Emma’s Soap, English Handmade Soap, English Soap, Handmade Norfolk Soaps, John Drury, Kay's, Kay's (Ramsbottom), Kay's (Ramsbottom) Limited, Little Soap Company, Lush, Made in England, Molton Brown, Mr Natty, Murdock, Murdock London, Nanny's Silly Soap, Natural Extracts, Natural Soap Company, Neal's Yard, Out of Eden, Pecksniff’s, PoshWosh, Potter and Moore, Pure Thoughts, Sainsbury's, Scottish Fine Soaps, Scottish Fine Soaps Company, Scrubbed by Nature, Simply Soaps, Soap, Soap and Glory, Soap Bars, Soaps, Soapy Jones, Superfine, Tala, Taylor of Old Bond Street, The Body Shop, The Natural Soap Company, The Soap Co, The Soap Kitchen, Toilet Soap, UK made soap, Waitrose, White Rose Aromatics, Wild Olive soaps, Woods of Windsor, Yardley on June 2, 2013 by ukmade.